Get more done in your day: print, scan, copy and fax at fast speeds, and keep tasks moving with the HP OfficeJet All-In-One printer. Expect vivid color, crisp, sharp text and borderless photos every time you print, plus breeze through print jobs using the 35-page auto document feeder and automatic two-sided printing. 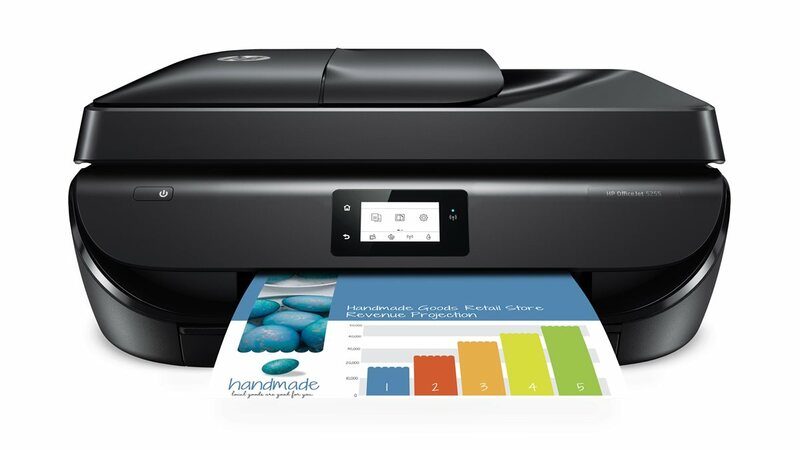 Easily set up your mobile printer, scan documents with your smartphone camera and print from social media or a number of cloud services with the HP Smart app. HP wireless printer syncs with your existing Wi-Fi network for easy printing from almost anywhere. Hands-free scanning, copying and faxing helps you finish off large tasks in virtually no time at all. HP wireless printer syncs with your existing Wi-Fi network for easy printing from almost anywhere. HP Smart app (separate download required) allows you to easily set up your HP wireless printer, scan documents with your camera and print from social media or the cloud, such as iCloud, Google Drive, and Dropbox. Get up to 10 pages per minute (ppm) black and up to 7 pages per minute (ppm) color. Recommended monthly volume of 100 - 400 pages. Breeze through tasks using the 35-page auto document feeder. Compatible with letter, legal, 4" x 6", 5" x 7", 8" x 10" and No. 10 envelopes. 2.2" capacitive touch screen features high-resolution monochrome LCD graphics and helps you quickly find the features and functions you need. Media Size A5 - 5.80" x 8.30"; Photo - 4" x 6"; Letter - 8.50" x 11"; C6 Envelope - 3.37" x 9"; A4 - 8.30" x 11.70"; B5 - 6.90" x 9.80"; DL Envelope - 4.30" x 8.60"; A6 - 4.10" x 5.80"; Envelope No. 10; 3.50" x 5"; 3" x 5.50"; Legal - 8.50" x 14"; 5" x 7"; 8" x 10"